My question is relating to how the Curtin–Hammett principle applies to homogeneous hydrogenation using chiral ligands. We commonly draw mnemonics (i.e. quadrant diagrams) to 'predict' the most likely products, however this prediction surely works on the assumption that the energy of the intermediate complexes is responsible for the overall outcome of the reaction since in using these mnemonics we're assuming that steric clashes are what determines the 'lowest energy' binding mode (which is supposedly not the case in the example in figure 1). Does the mnemonic take into account this kinetic preference, or are we only able to predict the product for hydrogenations not taking place via Curtin–Hammett kinetics? (and if so, can one generalise if the Curtin–Hammett principle is applicable for a given reduction? I seem to recall reading something along the lines of Ru(II) and Ru(I) systems operating by different kinetics, for example). 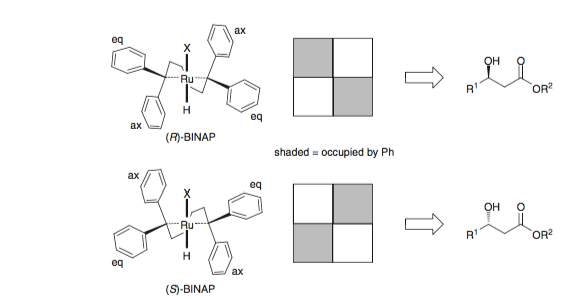 Ruthenium-BINAP complexes (and related complexes using modified ligand systems) are commonly employed for asymmetric homogeneous hydrogenation/reduction of a wide range of substrates (the general caveat is the need for 2 point binding in order to get suitable control). An example is below in figure 1 using a diphosphine ligand to selectively reduce the enamine, which introduces a new stereocentre and essentially furnishes an amino acid derivative. 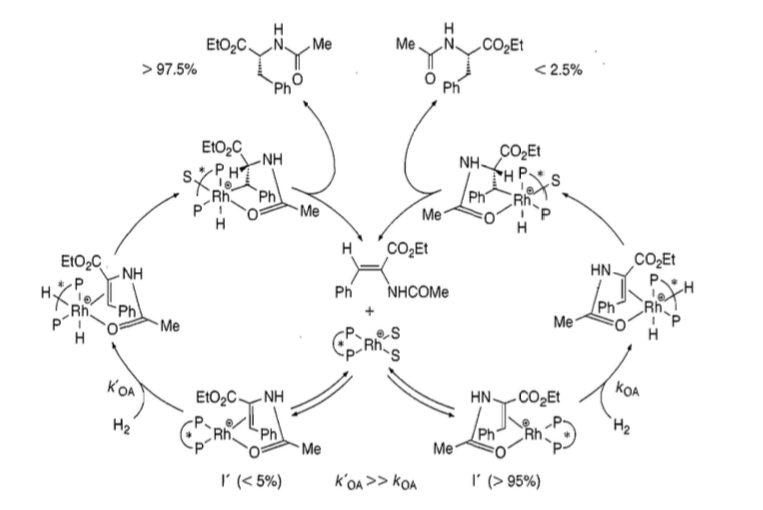 Figure 1: Example of a Ru-catalysed asymmetric hydrogenation (from Organotransition metal chemistry, from bonding to catalysis, Hartwig). When thinking about these reactions, we often use 'quadrant diagrams' and other mnemonics in order to predict how the substrate will bind (based on minimising steric interactions), but essentially binding of the substrate to the complex yields two diastereomeric transition states which are able to interconvert (figure 2). Figure 2: Proposed 'mechanism' of a Ru-catalysed asymmetric hydrogenation (from Organotransition metal chemistry, from bonding to catalysis, Hartwig). What is unusual in this reaction is that the energy (and hence population) of the diastereomeric intermediates does not have any influence on the ratio of products formed, with the higher energy/less populated intermediate being the one going on to form the product. This is an example of Curtin–Hammett kinetics, with the oxidative addition step, in this case, being the thing that determines which product forms. 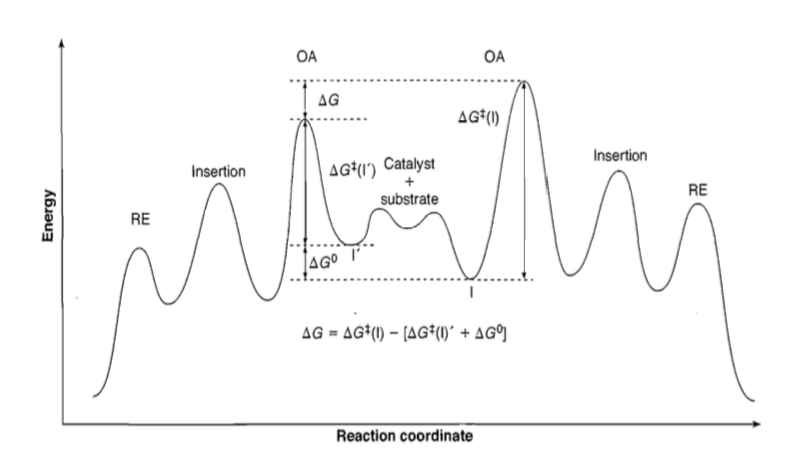 Figure 3: Reaction profile (from Organotransition metal chemistry, from bonding to catalysis, Hartwig). There's no way to predict this. Mnemonics are just rules, and rules are just rules. There will be exceptions, and you won't know when you should apply them a priori. If you could, it would be part of the rule by definition. The Curtin-Hammett conditions apply when the rate of interconversion between intermediates is significantly faster than the rate of reaction from the intermediates onto their respective products. If the rate of interconversion is slow, then the ratio of products is simply governed by the ratio of intermediates. The problem comes about from determining if the interconversion is fast. If you're looking at proton transfers or some kinds of conformational changes, it's usually pretty straightforward. Otherwise, only intuition can guide you ahead of time. Once you have experimental results, you might be able to rationalize this fact and determine that the reaction is governed by Curtin-Hammett kinetics, but there's no way to know for sure. This is just due to the complexity of binding entropy, solvent effects, etc, coupled with the intrinsic barrier for the forwards reaction. Not the answer you're looking for? Browse other questions tagged organic-chemistry reaction-mechanism kinetics organometallic-compounds reaction-control or ask your own question.